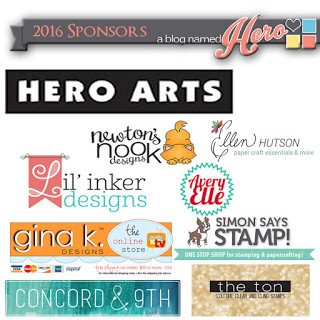 Share the Holidays with A Blog Named Hero and all our 2016 Sponsors! The Crafty Nurse here to celebrate the holidays and share a special thank you to all of our extremely generous 2016 sponsors. This is a special celebration with lots of prizes and opportunities to thank both our sponsors and you our loyal Blog Hop participants. Please leave a comment on one of our posts this month for a chance to win. For even more opportunity to win, enter a card in the challenge. Today I’ve used Ellen Hutson’s “Cozy Christmas” by Julie Ebersole. This is such a timeless set and so great for a quick holiday card. I always like to find different ways to use the stamps so the light string became a frame. I also only used part of the “smoke” to create different puffs out of each house. So clever to use the light string to make a frame. Need to work on my "thinking outside the box" thinking. Love the cozy feeling. Like the light strand framing of the houses on the card. That stamp set is adorable! I love your card, I agree it is timeless! Nicely done! Love how you framed the houses, and the warm glow coming from the window sure is cozy! YOur blog has been great this month. Love seeing stamp sets I have aand getting ideas! great sentiment for the Christmas themed card. I love how each house has a different smoke spiral! Great card. So sweet–I like the framing. Very cute card. It has a modern folk art feel to it. Well done. Simple cards are the best!! I love the cute little buildings and that fun frame! Those little houses with the lights shining through are so sweet! I always love stamped scenes on a card. Such a lovely card, I love these houses by Julie Ebersole! Gorgeous welcoming scene with the houses lit up. Love the sentiment too. A cozy little village indeed, nestled inside your creative frame! Timeless…warm…inviting! Perfect color choices on your amazing CAS card. Sweet card! Love the stamp set you used! The houses and trees are charming! Love the framing on here!